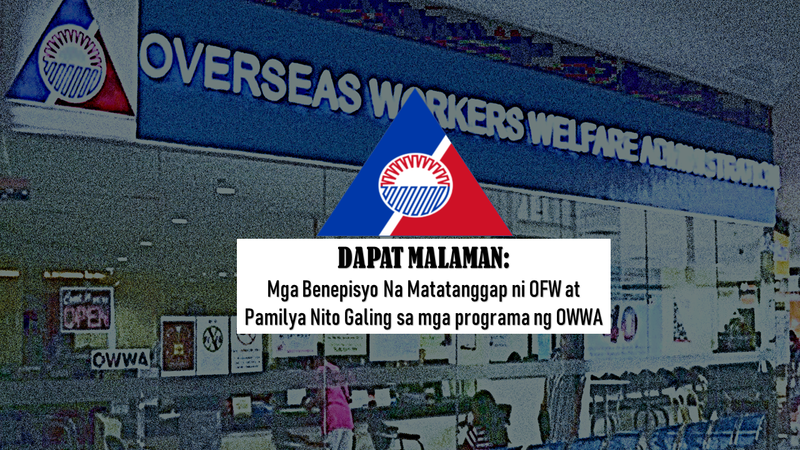 Upon processing of overseas contract at the POEA, an OFW automatically becomes a member of OWWA or Overseas Workers Welfare Administration upon payment of $25. The OWWA membership entitles an OFW to the following benefits within the contract period which is usually 2 years, which can also be renewed by paying the contribution again. A member is covered with life insurance for the duration of his employment contract. The coverage includes P100,000.00 for death due to natural cause and P200,000.00 for accidental death while working overseas. 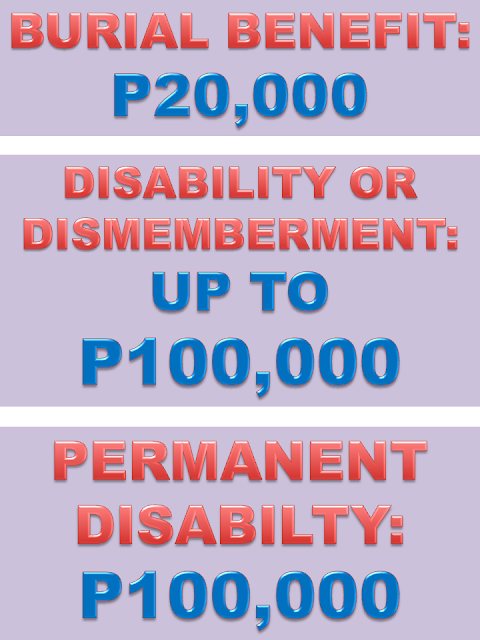 A member shall be entitled to disability/dismemberment benefits of up to Php 100,000 for injuries sustained while working. 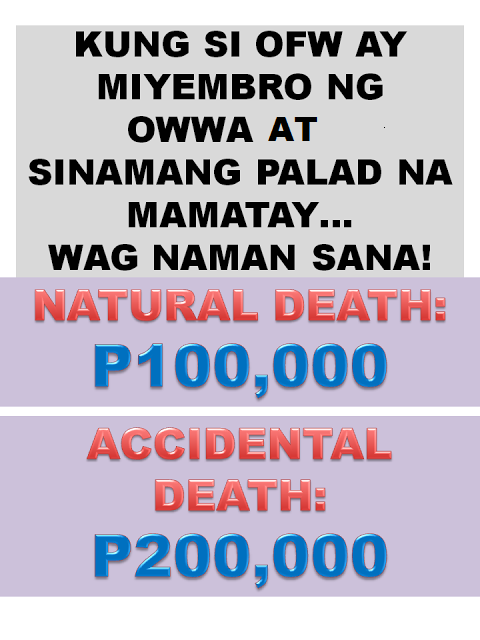 A burial benefit of P20,000.00 shall be provided in case of the member's death. An OWWA member are also entitled to PDEP, which includes the PDOS and CPDEP for household workers. A whole day orientation to OFWs consisting of a comprehensive module on employment contract familiarization, profile of the country of destination, stages of the OFWs life, health and safety, airport procedures, government programs and services. A 3 to 6-day live-out training for Household Service Workers (HSWs) consisting of language training, culture familiarization and stress management to prepare them for life overseas. 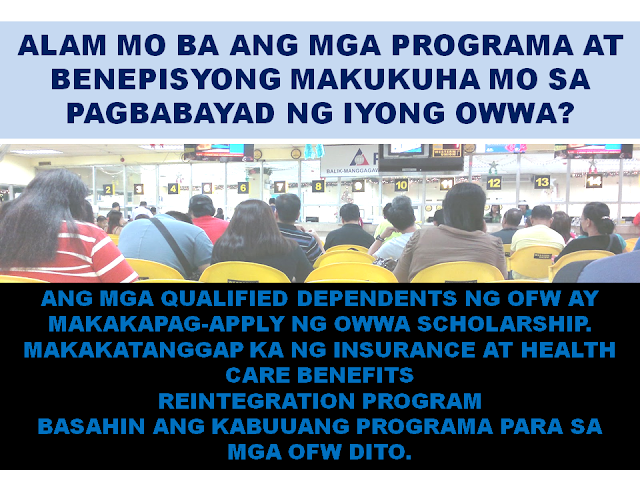 OWWA members can also apply for scholarships not only for the OFW but also for qualified dependents. 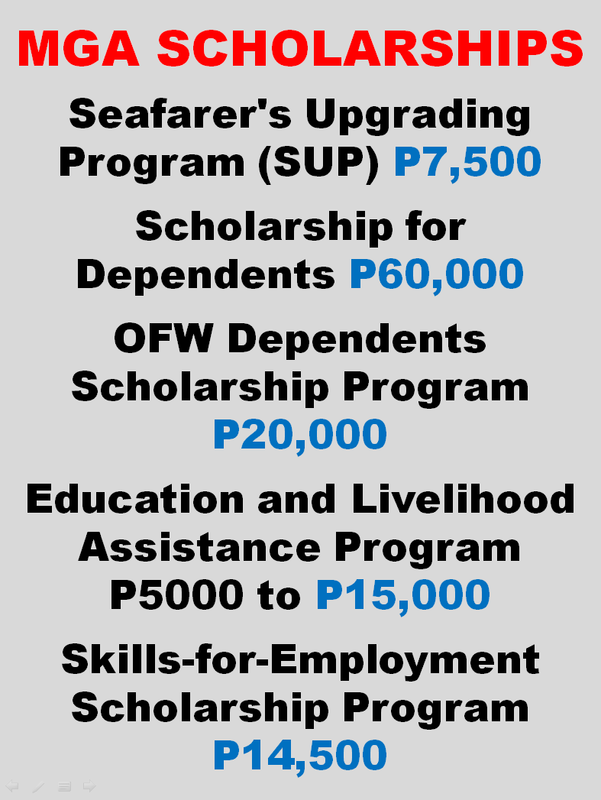 a) Seafarer's Upgrading Program (SUP) - Scholarships for attendance to short-term upgrading courses for seafarers. First availment consists of Php 7,500.00 training assistance. Availment in another training course every after 3 recorded membership. a) Education for Development Scholarship Program (EDSP) - Scholarships for qualified dependents of OFWs consisting of a maximum of Php 60,000.00 per school year, leading to a four-to-five year baccalaureate course in any college or university. b) OFW Dependents Scholarship Program (OFWDSP) - Scholarships consisting of a maximum of Php 20,000.00 assistance per school year leading to a baccalaureate or associate degree in a state college or university. OFW parents must have a monthly salary of not more than US$400.00. c) Education and Livelihood Assistance Program (ELAP) - Scholarships for survivors of deceased OFWs consisting of Php 5,000.00 for elementary, Php 8,000.00 for high school, Php 10,000.00 for college (per school year) and livelihood assistance of Php 15,000.00 for the surviving spouse. a) Skills-for-Employment Scholarship Program (SESP) - Scholarships for attendance to short-term training program consisting of a maximum of Php 14,500.00 per course leading to the completion of a vocational or technical course in any school accredited by TESDA. b) Information Technology Program - An Information and Communication Technology (ICT) skills training the purpose of which is to bridge the communication gap through the use of internet between the OFW and his/her family. Through this program, they learn how to use basic applications like Microsoft Word, Excel and PowerPoint. A. On-Site Welfare Case Management Includes requests for assistance on OFWs' whereabouts, pyscho-social counseling, conciliation, airport assistance, hospital/prison/work camp visitations and legal assistance to OFWs who wish to pursue labor / welfare case in the court of the host country. B. In-Country Welfare Case Management Includes requests by families and NOKs (next-of-kin) for assistance from Post, post-repatriation assistance, counseling, referrals, and other concerns. Requests for assistance from NOKs or from OFWs can be channeled through the 24/7 Operation Center and the OWWA Regional Offices. Reintegration is a way of preparing for the return of OFWs into the Philippine society. A. Reintegration Preparedness (On-Site) Includes trainings on value formation, financial literacy, entrepreneurial development training (EDT), techno-skills and capacity building trainings. Consists of job referrals (local and overseas employment), business counseling, community organizing, financial literacy seminar, networking with support institutions and social preparation programs. Reintegration Program is being implemented by OWWA and DOLE-National Reintegration Center for OFWs (NRCO). 2 Billion-Peso Reintegration Fund for enterprise development is a loan facility in cooperation with the Land Bank of the Philippines and the Development Bank of the Philippines, where a member or their legal dependent can avail of Php 300,000.00 to Php 2 million. "Balik-Pinas, Balik Hanapbuhay" is a program of DOLE-OWWA where displaced / distressed workers can avail of either starter kits worth Php 7,500.00 or a livelihood assistance of Php 10,000.00. What is in Sen. Recto's Balik-bayan Box Law? CIVIL ANNULMENT, HOW MUCH IS THE COST?